Doordarshan DTH DD Free Dish to offer 104 TV channels at the end of March. At the end of March, Doordarshan will come up with new decoder tv sat known as Freedish MPEG4 STB to improve the number of existing channels from 80 to104. The director of the Doordarshan, Supriya Sahu also said that five Doordarshan TV stations (DD National, DD news, DD sports, DD Kisan and local) are now available through the digital terrestrial transmission (DTT) in India. To further expand its DTH platform, Doordarshan is going to launch new MPEG-4 satellite tv box and to offer 104 TV channels by the end of March, the CEO Supriya Sahu, said on Sunday. 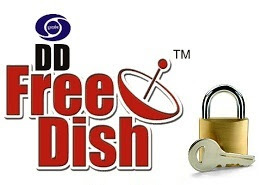 'Free Dish', the free DTH platform, which currently has 20 million subscribers, and is the market leader among the seven DTH players in the country, he said. "We have entered a new technology that is MPEG-4, so at the end of March we will be coming up with new set-top boxes for Doordarshan with a lot of improvement." The new initiative is to introduce the conditional access system in our satellite tv boxes. The number of available TV stations on Free Dish will increase from 80 to104, Sahu told PTI. He also said that five Doordarshan channels - DD National, DD News, DD Sport, DD Kisan and Local - are now available through the Digital Terrestrial Transmission (DTT) in India. "By 2018, 44 other cities will be digital (where DVB-T will be available)," he said. "DTT is now available in 16 cities and will be available to Hyderabad, Srinagar, and Thiruvananthapuram by the end of March. DVB-T allows Doordarshan viewers to watch free TV on their Android phones with small dongle (available online and in some stores) and no internet or data connection is needed to watch DTT TV stations said Sahu. She participated in the first edition of the International Festival of Asian Pacific Film organized by Prasar Bharati. "We have the capability of ten channels (via DVB-T)," he said, adding that once the IIM Ahmedabad, presented a business plan in the DTT roadmap to prepare his report before the first March, Doordarshan will be his strategy to Decide the supply of five more channels via DTT.